This story was updated at 10:45 a.m. ET. CAPE CANAVERAL, Fla. — A privately built unmanned spacecraft launched for NASA by the commercial spaceflight company SpaceX blasted into orbit Friday (March 1), but has experienced some sort of malfunction after separating from its rocket, the company says. The robotic Dragon space capsule launched into orbit atop SpaceX's Falcon 9 rocket in what appeared to be a smooth liftoff from a pad at Cape Canaveral Air Force Station in Florida at 10:10 a.m. ET (1510 GMT). 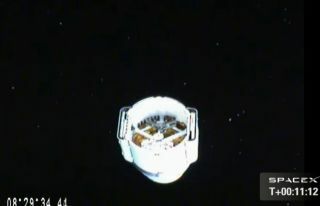 But once in orbit, SpaceX officials reported a problem just after spacecraft separation, when the Dragon capsule was expected to deploy its solar arrays. "It appears that, although it achieved Earth orbit, Dragon is experiencing some type of problem right now," SpaceX's John Insprucker said during the company's launch webcast. The glitch appears to be related to Dragon's thrusters, which allow the capsule to maneuver in orbit. SPACE.com will provide updates as new information is available. This mission is Hawthorne, Calif.-based SpaceX's second of a dozen contracted supply flights to the space station, part of a $1.6 billion agreement with NASA's Commercial Resupply Services Program. SpaceX's CRS-2 mission patch for the March 2013 flight to the International Space Station. The commercial space company was started in 2002 by Musk, a billionaire entrepreneur who also founded PayPal. The company's Falcon 9 rockets are named after the fictional Millennium Falcon spaceship from "Star Wars," while the Dragon capsules get their moniker from the song "Puff the Magic Dragon," Musk has said. Although storms threatened central Florida earlier in the week, the skies cleared in time, and the rocket was "go" for liftoff. The Dragon capsule is due to deliver 1,200 lbs (544 kilograms) of scientific experiments and supplies to the space station after docking on Saturday at 6:30 a.m. ET (1100 GMT). Among its bounty is food for the astronauts, including fruits picked from the orchard of a SpaceX employee's father, Shotwell said. The capsule is also carrying a copy of the song "Up in the Air" by the American rock band Thirty Minutes to Mars for NASA astronaut Thomas Marshburn, a flight engineer on the station. The orbiting outpost is currently home to six crewmembers, led by Expedition 34 commander Kevin Ford of NASA. Ford and Marshburn will use the station's robotic arm to grab the Dragon capsule and attach it to the station, NASA officials said. The flight will be Dragon's third visit to the space station, following a test flight in May 2012 and its first contracted cargo delivery mission in October of that year. SpaceX has taken precautions to avoid an engine anomaly that caused one of the Falcon 9's nine Merlin rocket engines to shut down during the October liftoff. Although the failure didn't prevent Dragon from docking safely to the station, it did cause a secondary payload, a prototype Orbcomm OG2 communications satellite, to miss its intended orbit and fall back to Earth. The residents of the space station have been preparing for Dragon's docking for some time, said Mike Suffredini, the manager of the International Space Station program office at Johnson Space Center in Houston. Engineers on the ground helped the astronauts update the space station's computers, including new upgrades to the software that controls the robotic arm that is expected to grab onto the capsule, Suffredini added. If all goes according to plan, Dragon should stay attached to the football field-sized station until March 25, when the capsule returns to Earth, splashing down in the Pacific Ocean off the coast of Baja California, agency officials said. NASA is funding these SpaceX missions in part to help replace the space agency's shuttle program, which NASA retired in July 2011. The agency also gave $1.9 billion to Virginia-based Orbital Science Corp. for eight cargo flights. That expenditure was part of the same program responsible for funding the SpaceX launch. Last week, Orbital Science Corp. successfully test-fired its Antares rocket, which the company will use in conjunction with its unmanned Cygnus capsule in transporting cargo to the space station. Between the shuttle retirement and the launch of SpaceX's first cargo delivery flight in October 2012, NASA relied solely on spacecraft built by space agencies in Russia, Japan and Europe to send supplies to the station, but those vehicles aren't able to return cargo to Earth. Instead, the craft burn up in the planet's atmosphere. Dragon, however, can bring cargo back to the ground to be studied or upgraded. This mission is slated to bring back about 2,300 lbs (1,043 kg) of space station material. The 14.4-foot-tall (4.4 meters), 12-foot-wide (3.6 m) Dragon capsule is the first solar powered American spacecraft to dock with the International Space Station. The space agency still relies on Russian Soyuz spacecraft to bring astronauts to the space station, but that could change eventually. NASA officials hope that a commercial firm, perhaps SpaceX or Orbital Sciences, will have the capability to send a manned mission to low-Earth orbit by 2017. SpaceX's next launch to the space station is scheduled for fall of this year. Although sweeping federal budget cuts, dubbed the sequester, are set to go into effect today, the cuts should not affect SpaceX's partnership with NASA, at least in the short term, Shotwell said, and the space station program should be similarly unaffected, according to Suffredini. Watch NASA astronauts attach the SpaceX Dragon capsule to the International Space Station live beginning on Saturday (March 2) at 3:30 a.m. ET (830 GMT) here on SPACE.com. Editor's Note: This story was updated after the spacecraft's launch to reflect an apparent anomaly after Dragon spacecraft separation.